Is This Biopic Really There? 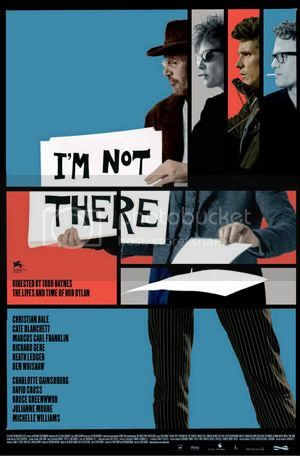 I'm Not There is a movie that requires rather extensive knowledge into Bob Dylan's life, to be truly appreciated. For those (such as myself) that only very few tidbits learned from Wikipedia, there is an enormous amount of confusing material, particularly the entire Richard Gere subplot. Cate Blanchett is remarkable in her portrayal of Dylan - not only is she convincing as a man, but she embodies Dylan's speech, smoking (although the cigarette is never lit for some reason), and looks more like him than any other of the Dylan representations. The opening sequence is done incredibly well, with a creative display of the title. The rest of the movie is filled with artsiness, for better or worse. For it's gutsiness and unique approach to filmmaking, as well as for branching out from the standard Hollywood fare, this movie deserves to be praised.